A question that comes up from time to time during initial discussions with potential new clients is “Will you produce design visuals to give us something to look at, to help us make our decision?”. It’s a frustrating proposition that we, like many other creative agencies, politely decline on. There’s good reason for this rejection though; as for us, producing speculative design work (sometimes referred to as ‘free pitching’) with little or no understanding of what the client may actually require or expect is very much a false economy. Not only do you run the risk of the client not liking what you produce (which is quite likely because there will have been no planning and research carried out at this stage) but it can be difficult to actually deliver on this ‘visual promise’ once you do actually know what they require. 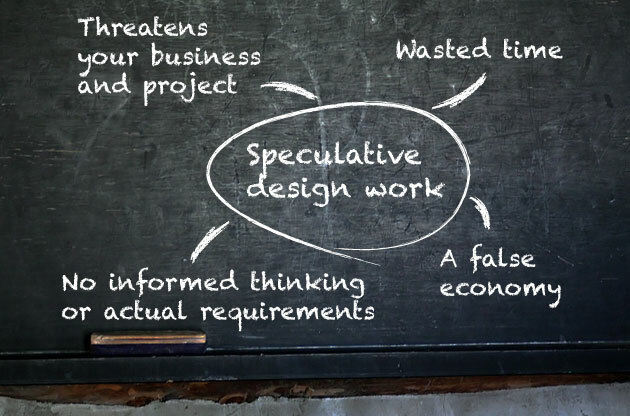 Spec work puts the entire project and potential the client’s business at risk. The reason for this risk is because design doesn’t just start with producing visuals of how the end website or system will look – it will inevitably change once you have a better understanding of how things are going to work. Initial research includes understanding business objectives and goals, writing a detailed specification for the project, wire-framing pages/systems where required and taking into account any UX* and UI** design considerations. Only once all of this work is completed and collated do we look to produce the first creative visuals. This stage should be about bringing to life all of the work done so far, presenting a design that requires minimum amendments to be finalised, because the groundwork has been signed off and agreed. We like to think that any potential client will have seen our design portfolio (or at least some of our work) and therefore has a level of appreciation of our design ability. That for us is where our online portfolio comes into play – to sell our design skills. The decision should be, does the potential client want to work with us – do they like what we have to say, and determining whether or not they see a fit between their business and ours? We should have hopefully given them the confidence that we’d do a great job on their new website. If the answer is yes, then we move forward with all of the important planning and research ahead of creative visuals. When you take all of this work into consideration there really is no place for a “Few quick thoughts”, or “A quick mock up” – phrases we have heard many times. The only thing being mocked is the project and both parties involved! We always want to produce work born out of detailed understanding and an informed creative design process. We see our role in this process as being a consultative one and we are here to educate and inform. Should you require any further information or have any questions on our design process or why we don’t ‘free pitch’ with speculative work, then please don’t hesitate to get in touch.